First Jewish grammarian and lexicographer of modern times; born near Cracow 1764; died at Vienna March 12, 1811. He received the religious education common to the Jews of Poland in those days. He married at a very early age and settled in Cracow in the home of his wife's parents, where he spent his days in studying Talmud, and his nights in clandestinely acquiring the knowledge of Hebrew philology and of secular subjects. The financial embarrassment of his family compelled him to seek his fortune in another land, and he naturally gravitated toward Berlin, which was then the center of the "Haskalah"; i.e., the movement to spread enlightenment among the Jews by means of Neo-Hebraic and German studies. Ben-Ze'eb was soon admittedto the galaxy of brilliant scholars and pioneers of Haskalah, who were to some extent considered as the disciples and successors of Moses Mendelssohn. Later, for about ten years, he lived in Breslau, where he wrote and published his Hebrew grammar, "Talmud Leshon 'Ibri," in 1796. Two years later he published his Hebrew translation of Ecclesiasticus, or Ben Sirach, which is called by Delitzsch ("Zur Geschichte der Jüdischen Poesie," p. 110) a masterpiece of imitation of Biblical gnomic style. Ben-Ze'eb returned from Breslau to Cracow, and later settled in Vienna as corrector in the Hebrew printing establishment of Anton Schmid, where he remained till his death. Ben-Ze'eb is the author of many valued works; his Hebrew poetry is marked by the purity of its diction and is not devoid of originality and profundity (Delitzsch, ib.). He was the first to systematize, in the Hebrew language itself, Hebrew grammar, to arrange it methodically and to facilitate the mastery of a good style by introducing logic, syntax, and prosody as part of grammatical studies. This accounts for the great success of his "Talmud Leshon 'Ibri," which work is an immense improvement over former Hebrew grammars and a step toward the introduction of Western methods in Hebrew literature. It has since been republished with additions, annotations, and commentaries more than fifteen times, and is still the most popular Hebrew grammar in use among the Jews of eastern Europe. The Wilna edition of 1874, with the commentary "Yitron le-Adam" by A. B. Lebensohn, is the most improved, and has been republished several times. 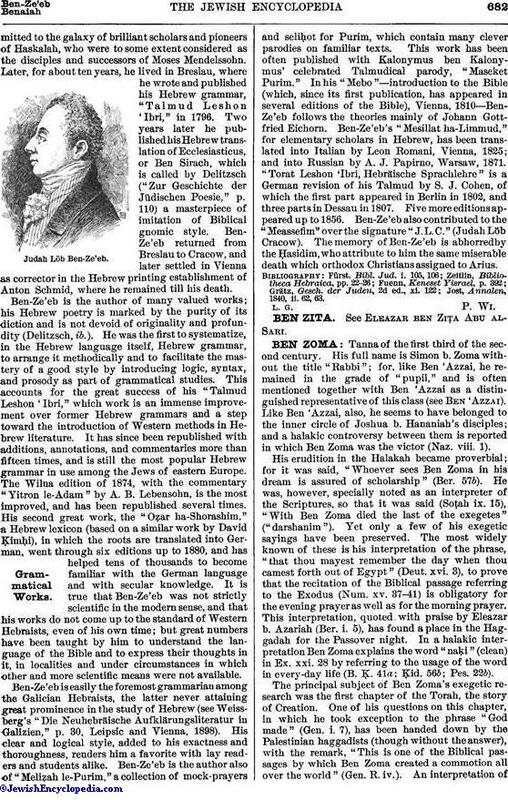 His second great work, the "Oẓar ha-Shorashim," a Hebrew lexicon (based on a similar work by David Ḳimḥi), in which the roots are translated into German, went through six editions up to 1880, and has helped tens of thousands to become familiar with the German language and with secular knowledge. It is true that Ben-Ze'eb was not strictly scientific in the modern sense, and that his works do not come up to the standard of Western Hebraists, even of his own time; but great numbers have been taught by him to understand the language of the Bible and to express their thoughts in it, in localities and under circumstances in which other and more scientific means were not available. Ben-Ze'eb is easily the foremost grammarian among the Galician Hebraists, the latter never attaining great prominence in the study of Hebrew (see Weissberg's "Die Neuhebräische Aufklärungsliteratur in Galizien," p. 30, Leipsic and Vienna, 1898). His clear and logical style, added to his exactness and thoroughness, renders him a favorite with lay readers and students alike. Ben-Ze'eb is the author also of "Meliẓah le-Purim," a collection of mock-prayers and seliḥot for Purim, which contain many clever parodies on familiar texts. This work has been often published with Kalonymus ben Kalonymus' celebrated Talmudical parody, "Maseket Purim." In his "Mebo"—introduction to the Bible (which, since its first publication, has appeared in several editions of the Bible), Vienna, 1810—Ben-Ze'eb follows the theories mainly of Johann Gottfried Eichorn. Ben-Ze'eb's "Mesillat ha-Limmud," for elementary scholars in Hebrew, has been translated into Italian by Leon Romani, Vienna, 1825; and into Russian by A. J. Papirno, Warsaw, 1871. 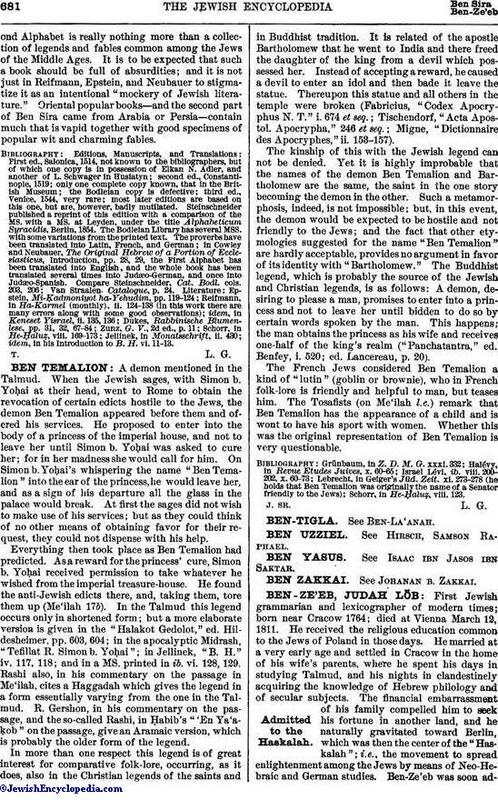 "Torat Leshon 'Ibri, Hebräische Sprachlehre" is a German revision of his Talmud by S. J. Cohen, of which the first part appeared in Berlin in 1802, and three parts in Dessau in 1807. Five more editions appeared up to 1856. Ben-Ze'eb also contributed to the "Meassefim" over the signature "J. L. C." (Judah Löb Cracow). The memory of Ben-Ze'eb is abhorredby the Ḥasidim, who attribute to him the same miserable death which orthodox Christians assigned to Arius. Jost, Annalen, 1840, ii. 62, 63.